The point of Exodus is this: God likes some people more than others. He likes Jews and hates Egyptians. That's why he hardened the Pharaoh's heart and sent the ten plagues on Egypt. He forced Egyptians to drink blood; pestered them with frogs, lice, flies, and boils; smashed them with hail; murdered every first-born Egyptian child and animal, and drowned their army. Sometimes God gets a bit carried away when making a point. There are some people, though, that God hates even more than Egyptians. Amalekites, for example. God hates Amalekites more than anyone else on earth. He's been at war with them for 3400 years and he'll be at war with them forever. But God often hates Jews too. When Aaron made a golden calf and encouraged the Jews to dance naked around it, God wanted to kill them all. But Moses talked him out of it. So God was satisfied with forcing some of the Jews to kill their families, friends, and neighbors. 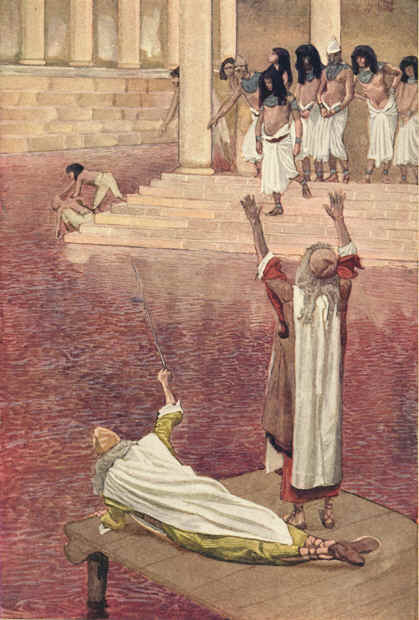 The first of the famous ten plagues of Egypt was the plague of blood. Here's the story from Exodus 7. God told Moses to tell Aaron to smite all the water in Egypt with his rod (the one that he previously turned into a serpent and then back into a rod in Exodus 7:9-12), which will change the water into blood. And it worked as planned. The fish died, the river stank, and the Egyptians had no water to drink. Which must have killed some people, since, even under the most favorable conditions, a person can't survive for more than a few days without water. The Bible doesn't say, so I guessed 10,000. 10. The seventh plague of Egypt: Hail shall come down upon them and they shall die. The Bible doesn't say whether anyone died from these plagues. Frogs, lice, flies, dead animals as far as you can see, and boils covering every person and animal in Egypt. These things were no doubt unpleasant. But did it kill anyone? There's just no way of knowing. But the Bible is clear about the seventh plague: hail. So God killed everybody in Egypt who was out and about that day with fire and hail (except Israelites). But how many people would that have been? Well, the Egyptian population is estimated to have been 3 million at the time the Exodus supposedly happened . 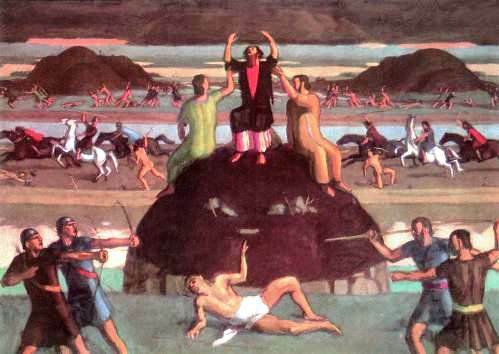 So if maybe 10% of the Egyptians were in the field at the time, about 300,000 would have been killed by God's fiery hail storm. God starts planning this mass murder in Chapter 3 of Exodus, and he doesn't stop talking about it until he kills every Egyptian firstborn child (and animal) in Exodus 12. Here was the way God planned it. On the night of the mass child murder, God told each Israelite family to find a year-old lamb without blemish, kill it, and wipe the blood on the top and sides of the door. 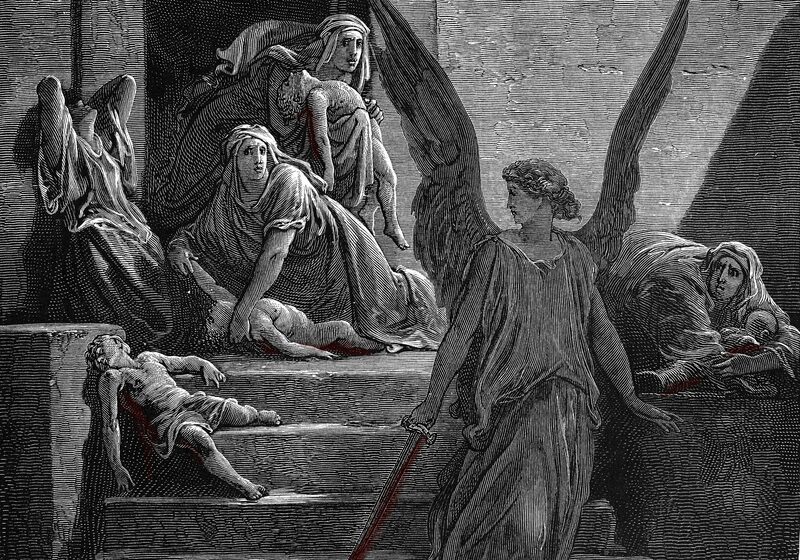 That way when God came through Egypt looking for first born children and animals to kill, he would see the bloody door and "pass over" the house, saying to himself, "Oh yeah, I'm not supposed to kill any children or animals here." At midnight God passed through Egypt killing every Egyptian first-born child and animal. After God was done, there was not a single Egyptian house that didn't have one dead child. Why did God do it? And to punish the Egyptian Gods. Well, I guess those motives are about as good as any for a mass murder. In any case, God is clearly proud of this one. And it's no wonder. It wasn't all that easy to pull off, even for God. He had to harden the Pharaoh's heart eight times to make it all work out as planned. Some hearts are hard for even the Bible god to harden. So how many were killed in this killing? Well, the population of Egypt at the time the Exodus supposedly occurred was about 3 million . If one-sixth of them were first born sons, a half million Egyptians were killed by God (or the angel sent by God to do his dirty work for him). God's last mass murder pretty much did the trick. The night that God killed every firstborn Egyptian child and animal, Pharaoh told Moses to go. So Moses rounded up all three million or so Israelites, their flocks, herds, cattle, unleavened bread, and all the silver, gold, and clothes that they could steal from the Egyptians, and left town. And everything would have ended happily ever after, too, if God could have resisted the temptation to harden the Pharaoh's heart a few more times. So God hardened Pharaoh's heart some more and got himself a little more honor. Of course he had to kill some more Egyptians so that they would know that he is the Lord. Sometimes you have to kill people in order to get to know them better. So that's what God did. And you saw the movie so you know the rest of the story. God parted the sea so the Israelites could cross and then drowned the Egyptian army. But the part I like best they didn't show in the movie. God got right out there with his wrenches and whatnot and removed the wheels from the Egyptian chariots. How cool is that? That would have been fun to watch. OK. So how many Egyptians drowned to get God some more honor? Well, we know there were at least 600, since that's how many chariots the Pharaoh sent after the Israelites. But along with the chariots there were "horsemen, and all the host of Pharaoh" that chased after the three million or so escaping slaves. So although I probably greatly underestimated the imaginary number, I guessed 5000. Before the Israelites had even left Egypt, they began to do what they do best: complain. They complain when they see the Pharaoh's chariots. They complain when they're starving to death. They complain when dying of thirst. Before long, God will respond to their complaints with several mass murders. But we'll leave that for another time. Because now it's time for some Holy War. The Amalekites show up and the fight begins. God controls the whole thing with some remote control magic tricks. Every time Moses holds his hands up, the Amalekites are slaughtered by the Israelites. When he gets tired and lets his arms down, the situation is reversed. Eventually they had to set some rocks under Moses' arms to make sure that the right people got killed. But it all worked out just fine. It's too bad, though, that the Bible doesn't say how many Amalekites died in this magical holy war, because now I'll just have to guess. Oh heck, I'll call it 1000. But God was far from done with the Amalekites. In fact, he is fighting with them still and commands us all to kill them wherever and whenever we see them. So if you happen to see an Amalekite, you know what to do. 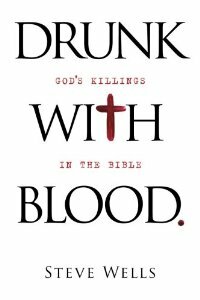 In his previous killings, God killed indiscriminately. He drowned everyone and everything in the flood (1), smashed people with burning stones at Sodom and Gomorrah (3), and killed every Egyptian firstborn child and animal just for the heck of it (9). So I guess we should be used to this sort of thing by now. But in this killing, God forces 3000 friends and family members to kill each other. That seems kind of nasty even for a very nasty god. You might think that a bunch of runaway slaves wouldn't have much gold. But God told them to steal whatever jewelry they could find from the Egyptians. I guess God wanted them to have enough gold to make a golden calf. It was all part of his plan. So the people gave Aaron their stolen gold and Aaron made a golden calf. Now making a golden calf out of a pile of ear rings and a campfire might seem hard to you. But Aaron just threw them all onto a fire and out came a golden calf. Really. It was a miracle. God (or Satan) made the golden calf when Aaron threw the jewelry on the fire. In any case, when Moses came down from the mountain, he saw the people dancing naked ("for Aaron had made them naked") around the golden calf. So he smashed the stone tablets, burned the golden calf, ground it into a powder, sprinkled it on water, and then forced everyone (all 3 million of them) to drink it. So those on God's side went out and killed 3000 of their friends, neighbors, and family members. But God still wasn't satisfied. When he first found out about the golden calf and the naked dancing he wanted to kill everyone and start over with a new batch of people. But Moses talked him out of it, saying, "What would the Egyptians say?" In his last killing, God forced the Israelites to kill each other. (The Levites volunteered for the job of "being on the Lord's side" by killing their family, friends, and neighbors for God.) The resulting death toll was 3000. But this didn't quite satisfy God. He needed to kill some more. So he sent a plague. 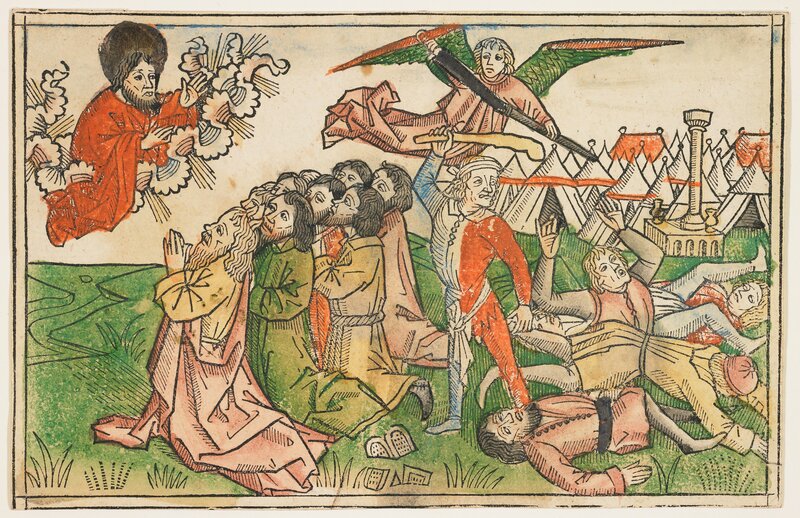 The Bible doesn't say how many people God killed in this plague. I'll guess 1000. Colin McEvedy and Richard M. Jones, Atlas of World Population History (Middlesex, England: Penguin, 1978), p.226. McEvedy and Jones, 1978, p.226.